Every mushroom expert repeats the same mantra: "Never eat a mushroom unless you can positively identify it." Identification isn't always easy, though. Mycologists have catalogued approximately 14,000 different mushroom species worldwide and classified them into a number of distinct genera. Each genus typically includes edible and inedible species, and many of these look similar. The genus Amanita is a case in point. It includes the poisonous Destroying Angel (Amanita virosa), the delicious Caesar's mushroom (Amanita caesera) and the hallucinogenic Fly Amanita or toadstool (Amanita muscaria). How do you know which of these you've just come across? A mushroom guide is a must for anyone interested in foraging for mushrooms. It's helpful if the guide includes pictures of poisonous mushrooms, but because of the sheer number of possibilities, it's even more helpful if the guide can zero in on a species as you enter information about the specimen you found. One such mushroom guide, posted by researchers from the University of Aarhus and University of Copenhagen, Denmark, is available online. It's called MycoKey, and it isn't the only such guide. A number of factors enter into a positive identification. They include not just appearance, but also location, season and growing conditions. Even if you can't make a positive identification, some general characteristics can alert you to the likelihood of a dangerous species. A mushroom appears to grow like a plant, but it isn't a plant. Genetically, mushroom bodies are closer to those of animals, but a mushroom isn't an animal, either. It's a fungus. In fact, a mushroom isn't even something that grows independently. It's just the fruiting part of a hidden organism called a mycelium. The mycelium is a weblike structure that grows underground or inside the pores of decaying wood, and it can grow very large. A mycelium that grows in the Blue Mountains in Oregon measures 2.4 miles across and is arguably the largest living organism on Earth. Cap – This may be parasol- or cup- shaped, conical or round, and it may be mottled, smooth or covered with small nibs. It may or may not have a skin that is easy to peel off. Stem – The stem reaches from the cap to the growing medium. It can be long and slender or short and fat. It may or may not be hollow. Not all mushrooms have a stem. Those that grow on decayed wood often don't, nor do puffballs, which are large, round and mostly edible (although some poisonous mushrooms look like puffballs when they're younger, so you can't assume that puffy thing on the ground is safe to eat). Gills – The gills are the spore-producing part of the mushroom. They are on the underside of the cap and may be ribbed or consist of a large number of small holes. Some mushrooms have protuberances called teeth instead of gills, and some, such as chanterelles, have veins. Ring or Annulus – When a ring is present, it's usually wrapped around the stem just underneath the cap. It's a vestige of the universal veil the mushroom had to break through as it sprouted. Volva – The volva is a bulging section at the base of the stem. It's often underground. The presence of a volva, especially one with a ring around it, is often an indication that the species is poisonous. Mushrooms with white gills are often poisonous. So are those with a ring around the stem and those with a volva. Because the volva is often underground, it's important to dig around the base of a mushroom to look for it. Mushrooms with a red color on the cap or stem are also either poisonous or strongly hallucinogenic. The most notorious red-colored mushroom is Amanita muscaria, which has been consumed for thousands of years to produce visions. In large doses, even this "magic mushroom" can be lethal. Other Amanita species also have this coloration, and they are far less benign. The consequences of misidentifying a mushroom are severe, so it's important to ask yourself a series of questions before even touching one you've come across. Where is the mushroom growing? If it's under a tree, what kind of tree is it? If it's growing on wood, what kind of wood? For example, hens and chicks mushrooms are usually safe – even medicinal – but they have the potential to make you sick if they are growing on conifers, eucalyptus or cedar trees. You should also note whether the mushroom is growing alone or in a cluster, in sun or shade and what time of year it is. If you feel confident enough to handle the mushroom – preferably using gloves – you can examine the gills, check the stem for rings and look for a volva. Press on the cap or make a small cut with a knife. Does the cap change color, and if so, what color? You might also cut off a small piece and smell it. Poisonous mushrooms often have an unpleasant, acrid smell, while benign ones smell refreshingly mushroomlike. You can also get information by cutting off the stem and placing the cap on a piece of paper gill-side down for a few hours to get a spore print. A white spore print is a telltale sign of an Amanita species. It's worth repeating the warning to never eat a mushroom until you can positively identify it. An efficient way to make a positive identification is to use a online catalogue. You can identify a dangerous species by looking at pictures of poisonous mushrooms, but if you can't find any, navigate to a site that allows you to enter information about the specimen so you can zero in on the species. The search usually begins with the general shape of the specimen and its gill structure, and then proceeds to specifics, such as cap and gill color and texture, size and growing conditions. Once you've zeroed in on the genus and species, you can look up information about the edibility – or lack thereof – of the specimen. Remember that mushrooms can be deceptively beautiful and dangerous at the same time. The aptly named Destroying Angel is a good example. Moreover, dangerous mushrooms can look like benign ones. For example, a sprouting Amanita looks like a young puffball, and you can't tell the difference until you pierce the veil and look for gills inside, which mean the specimen is probably toxic. If you're not sure, leave the mushroom alone. Deziel, Chris. "How to Identify Poisonous Mushrooms." 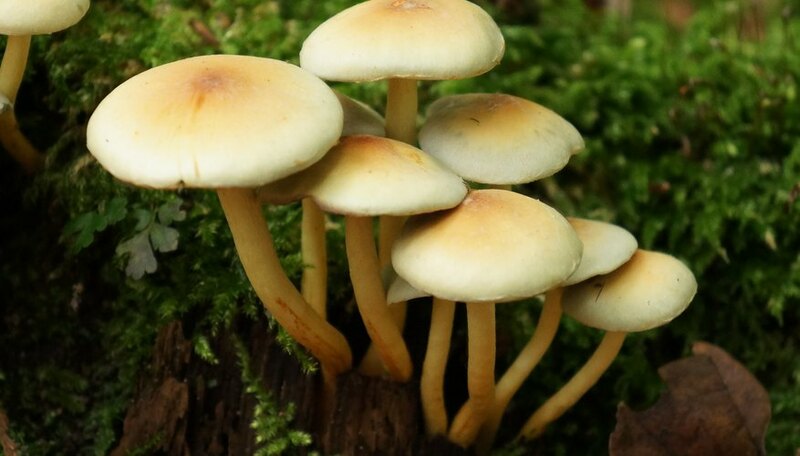 Sciencing, https://sciencing.com/identify-poisonous-mushrooms-2057768.html. 15 December 2018.